A few weeks ago, I heard my student screaming in the bathroom. I mean really screaming. The bathroom is located right across the hall from our class and two of us bolted to the door to see what the problem was. 8,000,000 things went through my mind in the 4 seconds it took me to get to the door. Was she hurt? Did she cut herself? Had she broken her leg? We knocked frantically and went into the bathroom and breathed a deep sigh of relief. My student was having her first period. She was bawling and very upset because she did not understand what was happening to her. My student has a Developmental Disability that impairs her ability to process information so explaining this was normal was a very difficult thing for her to understand. I called mom to let her know what had happened and supported the student through the remainder of the day until it was time to go home. I explained to the student multiple times that it was part of growing up and that all women experience this but she still seemed incredibly confused by the whole thing. I went home that night and decided it was time for my 5 girls to learn about their menstrual cycles. However, I have never tried to teach students with Developmental Delays about what happens during puberty. I thought about what I needed to do to explain this effectively. The next day I spoke with the parents of the other four girls and told them that we would be speaking about this in class. I wanted to prepare them in case they came home and had questions. Some of my student’s ability to communicate is quite impaired so when they come home talking about blood with no context there could be some confusion. I made a time in our schedule over the next 6 weeks for the girls and boys to do a separate activity. The girls stayed in the classroom and the boys went for a walk. 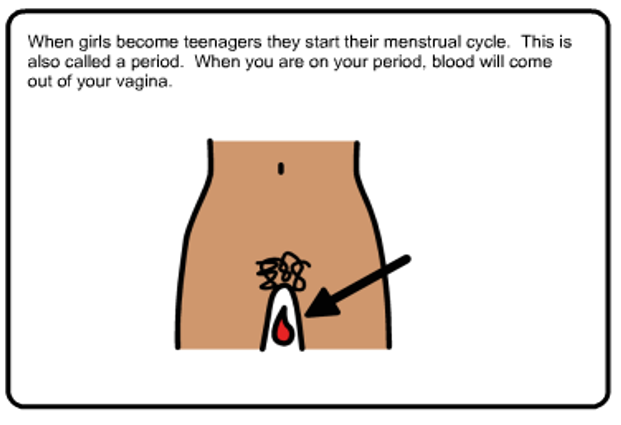 During that time, I used visuals to explain when a woman grows up, she gets a period. I explained what a period was to my girls using the most basic language and pictures I could think of. It has taken some time but my girls are starting to understand. For my group, I have had to reassure them consistently that it is healthy. The word healthy was something that they all understood. They knew if you ate vegetables it was good for your body and it made you healthy. It is a word that obviously resonated and made sense for them. After using that word, they all stopped looking so horrified about the concept of becoming a woman. Privacy has also been a real challenge for some of my students. The day after our first big talk, my student walked into school and was so excited to tell me that she explained everything to her mom and dad last night about periods. She said it so loudly that an entire class of grade eight students next door to us heard it and burst out laughing. My other student walked in and loudly asked my other student “how’s your period going?”. My girls have had to be reminded multiple times that periods are private and not something we talk about in public. Throughout the past few weeks, we have also purchased pads from the grocery store and practiced putting them on underwear correctly. We will continue learning about puberty and menstruation until all of my girls develop the skills to manage their monthly cycle independently.